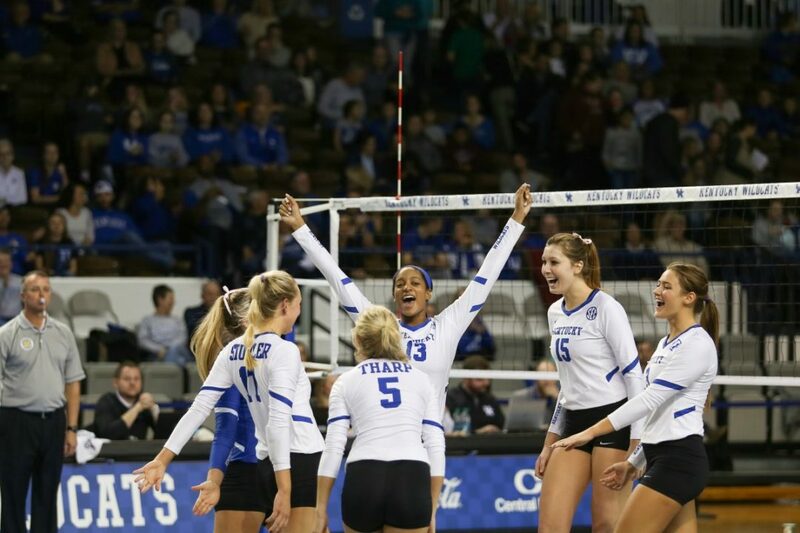 LEXINGTON, Ky. –The 10th-seeded Kentucky volleyball team put together a dominating performance of Purdue on Saturday night in Memorial Coliseum, sweeping the Boilermakers, 3-0 (25-20, 25-21, 25-14) to punch its ticket to the Sweet 16 in front of 2,794 blue-clad fans. It marks the second-consecutive season and fifth time overall that the Wildcats will march on to the round of 16 under head coach Craig Skinner. Kentucky pushed its winning streak to 22 in a row and improves to 26-4 on the season. Purdue’s season concludes with a 24-9 overall mark. Kentucky will await its opponent and regional location upon results from around the country tonight. Gameday and ticket information will be made available at gophersports.com shortly. It took a bevy of outstanding performances once again for the Wildcats. Sophomore setter Madison Lilley dished out 37 assists and added five kills of her own, while also contributing five digs. Lilley led the offense to 49 kills compared to just 27 for the Boilermakers. Defense was once again a staple led by sophomore libero Gabby Curry who had a match-high 18 digs. Classmate Kendyl Paris had a team-high three rejections. Freshman Lauren Tharp and senior McKenzie Watson added a combined six scoops to the winning effort. Freshman Alli Stumler produced another all-around effort. The Floyd Knobs, Indiana, native narrowly missed on a second-straight double-double with eight kills and a career-high-tying 15 digs. Her previous 15-dig performance came just last night in the opening-round win over Murray State. Stumler also chipped in two aces and a pair of assists. Junior Caitlyn Cooper was another dynamic performer with eight kills on a .400 hitting percentage to couple with two blocks. Junior Leah Edmond produced a match-high 13 kills, while also tacking on four digs and a block. She’s registered double-digit kills in all but two matches this season. Senior Brooke Morgan continued to shine with 12 kills on a blazing .429 hitting clip. She also had a career-high four service aces to set the tone for the Cats from the service line. Paris added three kills in the offensive rotation. Kentucky got off to a fast start, forcing an early Purdue timeout six points into the match leading, 5-1. After an Edmond kill to extend the lead on the succeeding point, UK stretched its lead to 6-1 and took control of the set. The Wildcats got a swing from Morgan midway through the set to take a 10-5 lead and held on to a multi-point lead for the majority of the set. After an Edmond kill from the left side that went cross-court, Purdue called its final timeout as Kentucky’s lead was extended to 17-11, the largest of the set. Purdue won six of the next eight points and Skinner called timeout when the Boilermakers closed the gap to two points at 19-17. Back-to-back attack errors set up set point for Kentucky at 24-20 and the Wildcats closed out the frame on Edmond’s fourth kill. UK hit just .125 in the set but was able to get 13 sideouts and force Purdue into five attack errors. Purdue was the aggressor in the second set, as it raced out to a 5-2 lead after a pair of reception errors by the Wildcats. UK then mounted a 5-0 run sparked by Edmond and Stumler and UK took its first lead of the set at 12-8. Purdue then rallied for five of the next six to pull within one and force the Wildcats into a timeout. 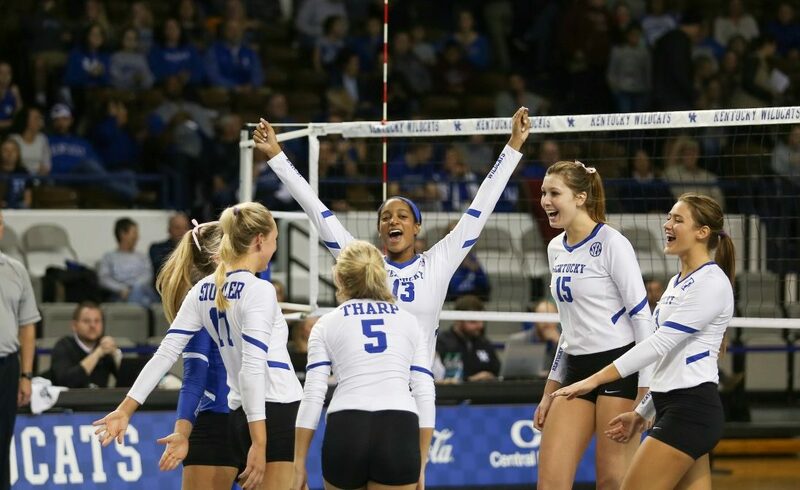 After the waters buoyed in the set and the teams traded points, Kentucky found its rhythm offensively through Lilley and Stumler who knocked to the floor her third kill of the set to push Kentucky up 20-17 and force Purdue into a timeout. The Boilermakers pulled as close as one, but kills by Stumler, Edmond and then Morgan on the right side slammed home a two sets to love lead for Kentucky. UK ended the set by winning five of the last six points. Edmond had six kills in the second set alone and ran her match total to nine. Stumler had four terminations, while Morgan had five in the second frame to run her match total to eight. Four-straight kills from Edmond pushed the Wildcats to a 9-2 lead in the third set and forced Purdue to call an early timeout following an unsuccessful challenge. A trio of attack errors against the Boilermakers in conjunction with two kills from Morgan on successive plays saw UK increase its lead to 14-6. The kill marked Morgan’s 10th double-digit kill match on the season. Morgan then recorded another ace to the back of the court and UK’s lead ballooned to 16-7 and Purdue called its final timeout. The 5-0 run was closed off on an attack error as Kentucky was up 18-8. Purdue got no closer than nine as a kill from Lilley and a forced attacking error enabled the Cats to secure the win behind a 25-14 set score. LEXINGTON, Kentucky – Facing its eighth nationally ranked opponent of the season, the No. 12 Purdue (24-9, 12-8 Big Ten) volleyball team battled, but ultimately fell in three sets to No. 10 Kentucky (26-4, 18-0 SEC). The Boilermakers fell by scores of 25-20, 25-21 and 25-14 on Saturday night at Memorial Coliseum. Redshirt junior Blake Mohler led the Boilermakers with Purdue’s most efficient performance of the night. Hitting a match-best .625 clip, the middle blocker delivered 10 errorless kills on 16 swings, while guiding the Boilermakers with eight blocks. Redshirt senior Sherridan Atkinson followed with nine kills, marking her first single-digit kill performance since Purdue’s loss to Michigan on October 6. Rookie setter Hayley Bush paced Purdue with 22 assists, while adding seven digs and four blocks. Defensively, the Boilermakers edge Kentucky 9-3 in blocks, but the Wildcats out dug Purdue 50-43.Freshman Marissa Hornung led the back row with 15 digs in the contest while senior Brooke Peters and sophomore Jena Otec added five of their own. The defense opened the match strong as the Boilermakers outhit Kentucky in the first stanza (.206-.125), but the Wildcats ultimately utilized 32 more swings in the evening to claim the match. Kentucky registered 18 kills in each of the last two sets, while holding Purdue to .176 and .034 hitting clips in the second and third set, respectively.